Note: This product is not compatbile with the second edition rules. 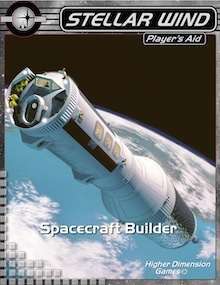 Spacecraft Builder is a Stellar Wind Player’s Aid. Player’s Aids are small works that provide useful tools for both GMs and players. This aid consists of two spreadsheets that do all the heavy lifting for you when building spacecraft. One in Excel format for Windows users who have Excel 2007 or later and one in Numbers format for Mac users who have iWork 09 or later. The Excel spreadsheet has basic formatting and performs all the required calculations for size, cost, downpayment, etc. based on your selections. You can then use the final information to fill out your Spacecraft Data Record sheet. The Numbers version fills out a Spacecraft Data Record for you as you work through the spreadsheet. When finished, you can copy and paste the resulting data record into Preview for printing. The Numbers version WILL work on an iPad (if you have Numbers for the iPad) with some reduction in the spreadsheet functionality, but the data record sheets WILL get filled out. If you are a Windows user, simply email the Numbers file to yourself and open it on the iPad, then tap the icon in the upper right corner of your iPad screen and choose to open the attachment in Numbers.